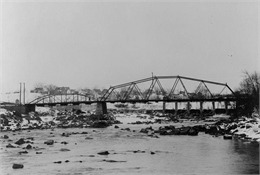 Old Bridge over Black River, 1920 ca. Black River Falls is located 39 miles northeast of La Crosse and is the seat of Jackson County. The Ho-Chunk Indians lived off the land around Black River Falls until they were removed to Nebraska in the winter of 1873-74. They came back to the region in 1874 to live, chopping wood, hunting, fishing and picking berries. By 1881, most were placed on homesteads in an attempt to assimilate them to American culture. The Ho-Chunk nation has its administrative center in Black River Falls. Even though a sawmill opened in Black River Falls in the winter of 1818-19, most identify Jacob Spaulding as founder of the city in 1839. Lumber attracted the settlers who set up sawmills powered by the Black River. Mormons came to the town in 1842 but left after the death of Joseph Smith. The town’s first church opened in 1847, and the first school in 1848. The town was destroyed by fire in 1860 but was rebuilt in 1861. 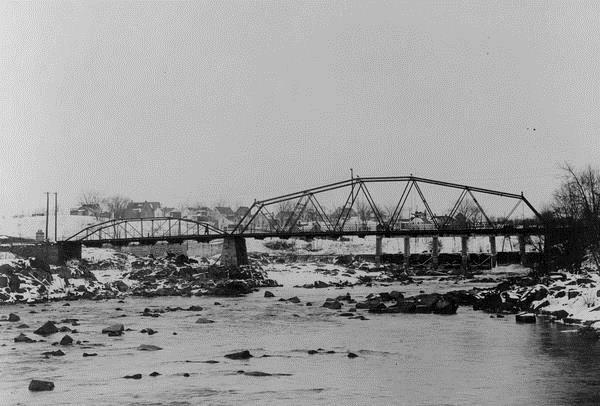 A damaging flood in 1911 also caused serious damage to the city. See more images, essays, newspapers, museum objects and records about Black River Falls.